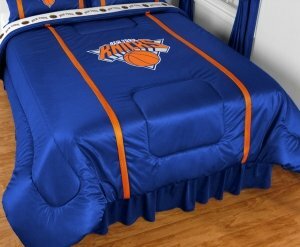 NBA new York Knicks side-lines comforter KING Knicks , comforter KING 102" x 88". covers are 100% polyester jersey top and bottom side, filled with 100% polyester batting. Logos are screen printed. Machine washable in warm water, and tumble dry on low heat. Made in USA. Cleveland Cavaliers NBA 6 Pc FULL Size Comforter Set (Comforter, 2 Pillow Cases, 2 Shams, 1 Bedskirt) SAVE BIG ON BUNDLING!